And of course I love Ashley Ann's blog, Under the Sycamore. So what's not to love about this project?! Ashley made this adorable decorated letter for her daughter's room using some of the Katie Daisy products that Target now carries. Isn't it beautiful?! I kinda have a thing for letters and numbers, so I could see myself making a few of these. :) I really want to find those thin wooden letters. All the stores around me have the thick, chunky ones. Anyone have any tips on finding them? After our little snow event this past weekend, spring is once again re-emerging. I hope she sticks around this time! So cute! I have mine and my husband's first initials from Anthropologie. They're fat and padded with pretty fabric. that is soo fun! imagine all the patterns you could find and then you can make whole words! p.s. your handwriting is gorgeous, I want it! 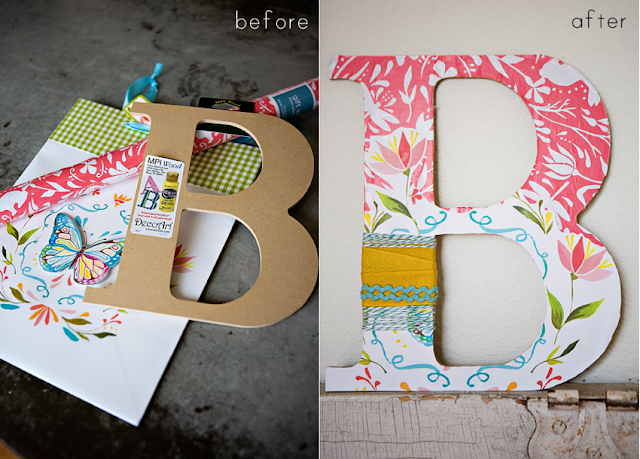 if you ever find the "chipboard" letters like Ashley used... let me know... or pick up a "D" and I'll pay you back :) LOVE that DIY!